RE Factor Tactical’s Dartboard Target combines shooting practice with the classic game of darts. 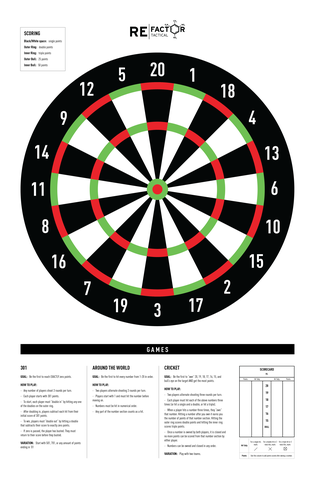 Along with the dartboard target itself, RE Factor’s Dartboard target also features three included games, a scorecard, and comes in at 18″ x 35″. Printed in the USA. This entry was posted on Tuesday, September 26th, 2017 at 00:53	and is filed under Training. You can follow any responses to this entry through the RSS 2.0 feed. Both comments and pings are currently closed.